CEO compensation in the largest firms dipped temporarily in 2015 and remains 940.9 percent above its 1978 level. This growth in CEO compensation far exceeded the growth of the stock market, which grew forty-two percent less (up 542.9 percent). This shows that executives have done far better than the firms they have led and executive pay cannot be simply attributed to better firm performance. Neither can the spectacular rise in CEO compensation be attributed to the ‘market for talent’ providing more rewards for those at the top. The wages of the top 0.1 percent of wage earners (top one out of a thousand) is a decent proxy for the pay of the most financially successful and grew a remarkable 320.5 percent from 1978 to 2014 (the last year for which data are available). 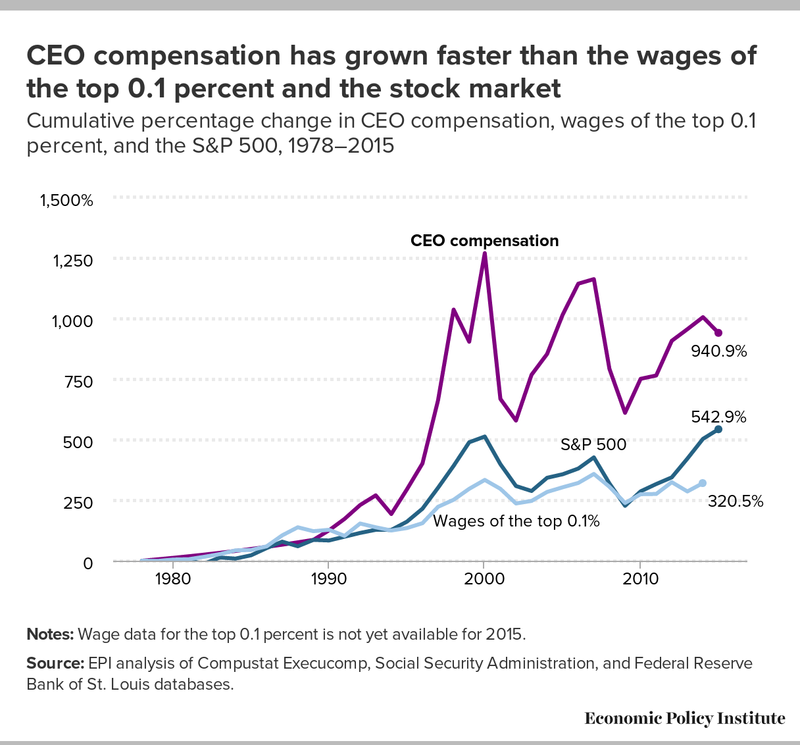 Yet, CEO compensation grew roughly three times faster than the wages of the top 0.1 percent. The fact that CEO compensation grew so much faster than the pay of other very highly-paid earners, and far faster than stock prices, indicates that unique dynamics are at play and that corporate governance is not adequately restraining executive pay. Notes: Wage data for the top 0.1 percent is not yet available for 2015. Source: EPI analysis of Compustat Execucomp, Social Security Administration, and Federal Reserve Bank of St. Louis databases. Read our recent report on CEO pay.